Mixed Bag of Rant: New Milestones! I realized that I talk all the time about my little man but I don't post many pics- so here's one of my little angel today! 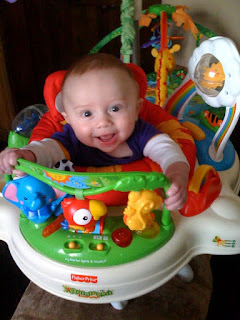 He's still a little short for his jumperoo so we put a pillow under his feet, but he discovered how fun it is to jump up and down and it is HILARIOUS. One thing that we have been waiting to see him do is to roll from back to tummy. They said he'd been doing it at daycare but had yet to do it at home up until last night. He rolled over right on his belly and just kept doing it over and over and over... It was so awesome. With that, we knew that our decision to remove the swaddle was likely a smart one. Granted, when he's swaddled like he was, he doesn't have a lot of ability to necessarily move himself to roll, but still. I don't want to take that chance. He actually slept like an angel last night. I'm thinking all he wanted to do was have the freedom to find his own comfortable position- it just happened to be his tummy. I woke up to such a sweet sleeping darling this morning. I'm also proud to announce my own milestone. I have officially lost the BABY weight! Everything that I gained during my pregnancy is officially gone and I am so proud to have done it in only 5 months. I gained about 40 pounds in pregnancy and it is ALL GONE! I still have a lot of weight to lose in general (I was working on it prior to getting pregnant). If I lose 15 pounds, I'll be back to my wedding day weight which would be lovely. Once I get there, I'll set a new goal and we'll see how far I can go with it! Most importantly, we are hoping to get pregnant with our 2nd and last baby this year (ha! I'm thinking it will take another 2 years) and I want to be in optimal shape to be able to get through it. Sure, I did fine with Jack, but could've been better. Okay. I do feel it is my obligation as my opinionated bitchy self to comment on the Octo-Mom. First. She is absolutely, positively BATSHIT CRAZY. How nice it must be to be able to do IVF and have plastic surgery on someone else's dime. When we were considering IVF, we were considering using our life's savings, a 2nd mortgage... you name it. So tell me again how someone who is on welfare, whose home is about to be foreclosed on was able to do IVF? Okay, and tell me again how it is okay for this single, obviously poor woman to think she can even remotely afford to have this many children? I'll tell ya. My DH and I? We work our asses off. We make six figures a year and feel like having a 2nd child will be a huge strain on our finances. We no longer have any "luxuries" that we had prior to having Baby Jack. I just think Octo-Mom is the most irresponsible person in the universe as is her doctor for even allowing this. I guess as someone who is married, has a nice home, goes to church and had a lot of trouble conceiving our first child, this whole thing just hurts and pisses me off that she so easily had these kids, yet can't even remotely afford them (even on the taxpayers dime), and so many struggle to have even one. It just plain isn't fair. Do they deserve to be taken away? I don't know what goes on in that house but if the conditions warrant it or if their emotional well-being is at stake? Yes. She could love those babies more than anything in the world, but if her mental health puts those babies at risk, then yes, they should be put in a more stable home. Anyway, I could go on and on. I just really don't want to see a reality show with her in it. I will boycott it in a heartbeat.